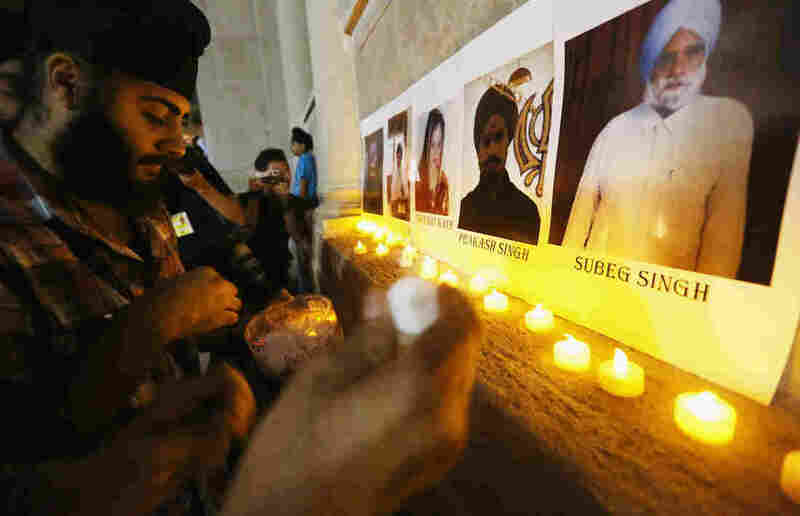 Reports: Sikh Temple Shooter Acted Alone, Had No Drugs In System : The Two-Way Because Wade Michael Page killed himself, we may never know his motive for opening fire on a temple. In the end, six people were killed. The FBI says there is no evidence his affiliation with white supremacist groups led to the shootings. Photos of victims are seen during a candlelight vigil in Union Square for victims of the Wisconsin Sikh temple shooting on August. The FBI has concluded its investigation into the shooting spree at a Sikh temple that left six dead. After interviewing 300 people and following 200 leads, the FBI concluded that Wade Michael Page acted alone when he opened fire at the Oak Creek, Wis. temple in August. What's more, reports The Milwaukee Journal Sentinel, because Page killed himself, we may never know his motive. The FBI said that there was no evidence that Page acted because of his connections to white supremacist groups. "Since the shootings, members of the Sikh community have lobbied Congress to require the FBI to track hate crimes against Sikhs. "Amardeep Kaleka's father, temple President Satwant Singh Kaleka, was killed trying to stop Wade. Amardeep Kaleka said Tuesday that his faith community largely was satisfied with the results of the investigation, though he conceded no one ever will really know why Page went on his rampage. "'Our chief focus now is that we are interested in what we can do as a nation to stop this from ever happening again,' he said." Local authorities also released the results of Page's autopsy. The AP reports that he had no drugs in his system. The toxicology report says that he had only a small amount of alcohol in his body. "An autopsy report says Page's many tattoos included skulls and crossbones on one forearm and the word 'Suffer' across his shoulders," the AP adds. The Milwaukee Journal Sentinel reports that the autopsy report also references "a slew of white supremacist tattoos on both arms and lower legs." "Page was shot in the right side of his abdomen and also had a self-inflicted 9mm gunshot wound to the back of his head," the Journal reports.